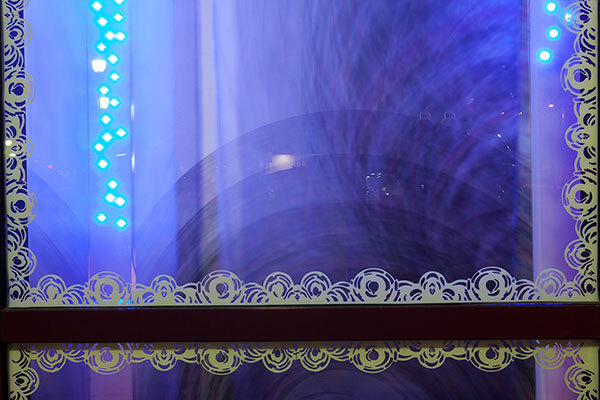 Viewers become part of a virtual window-front environment, where illumination and art-forms respond with playfulness to movement. 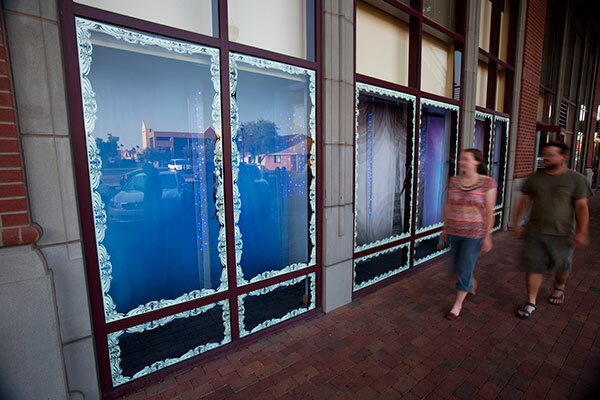 Three adjoined vacant storefront windows are filled with a full-sized digital image based on surface maps of Arizona’s cinematic skies. 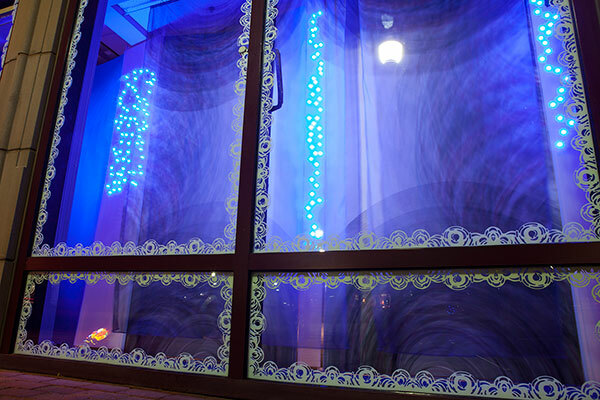 The same images are echoed on translucent silk panels. When pedestrians approach the windows, the silk panels billow while the lighting responds and changes. Delicate sonification enhances the feeling-tone of the artwork. Sonic transducers turn the window glass into speakers, increasing the immediate sense of realism and intimacy for viewers, who can activate a nuanced audio component by approaching the windows. Photo-luminescent window components absorb light during the day and keep the window aglow throughout the evening. Monsoons Nights seems to have a responsive life of its own. 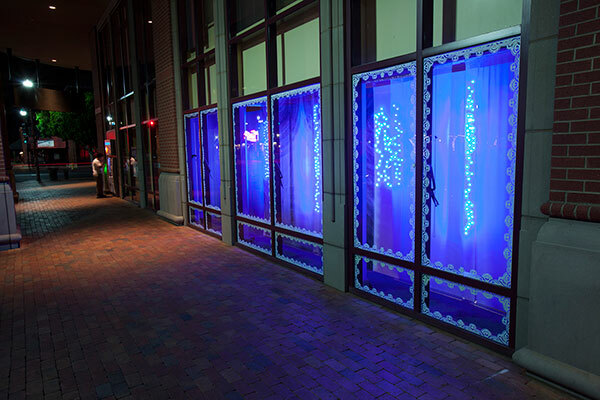 The windows engage those who pass by, echoing the rhythms of the street, with its business and education daytime orientation and its lively, buzzing nighttime scene. This artwork was commissioned by City of Tempe Public Art. 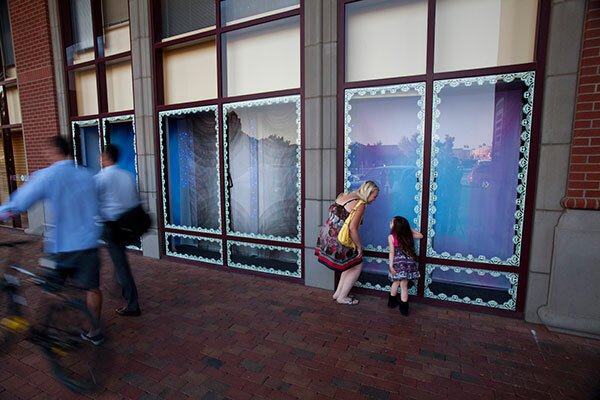 For its second cycle, IN FLUX featured expanded programming and an innovative regional partnership with Tempe Public Art. The artworks were on view April – October 2012.